In Acacia: The War with the Mein (2007), David Anthony Durham introduced the Known World, a multiethnic empire ruled for many generations by the Akaran dynasty. A rebellion forces each of the children of the reigning Akaran King to travel to a different part of the empire and adopt new identities, but in doing so they begin to learn the dark secrets of their heritage. The eldest of the children, Aliver, concludes that radical change is needed and leads a counter-revolution that rapidly becomes far more revolutionary than the original rebellion. The trilogy's second volume, The Other Lands (2009), revealed the eponymous other half of the world and detailed how, in the aftermath of Aliver's failure, his sister Corinn concludes that stability should not be sacrificed on the altar of idealism. She attempts to calm the storm Aliver unleashed by reasserting the traditional patterns of Akaran rule, but this requires a ruthless application of both imperial and magical power that serves only to drive the system farther out of balance. When the trilogy's concluding volume, The Sacred Band , begins, the entire world seems on the verge of being consumed in catastrophic warfare. The immediate crisis is in the far north, where the Auldek are marching across the top of the world to invade the Known World. Mena Akaran has been dispatched with a small army to stop them, but everyone knows there is no hope of victory. Mena is leading her soldiers to die in the hope they can slow down the Auldek long enough for Corinn to be able to mobilize a much larger force. Heroic defenders fighting courageously in the face of certain death is a time-worn sort of story, but for both the reader and Mena herself this iteration of it has a sour taste. The preceding books in the series have established Akaran rule in general as despotic, the sort of regime that is more properly the bad guys in an epic fantasy. More recently, Mena's sister Queen Corinn has ruled with an iron fist that, although theoretically justified by the dangers of the times, seems like a betrayal of Aliver's ideals. Is this a regime worth laying down one's life for? Mena's soldiers believe so, but she knows better. But if the Akarans are bad, the Auldek are worse. Earlier in the series it was an open question whether they were human at all, for their near-immortality and delight in violence made them seem more like monsters. 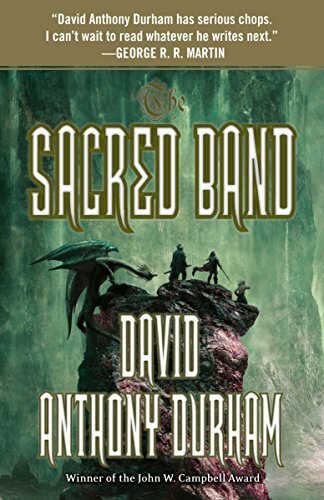 The Sacred Band finally sheds light on their culture and provides a more nuanced picture. For countless generations, the Auldek have sold the drug mist to mysterious magicians called the Lothar Aklun, who gave in payment what they received from the Known World: kidnapped children. While some of these children are allowed to grow up and become lifelong slaves, many are consumed by the magic of the Lothar Aklun to indefinitely lengthen the lives of the Auldek. The process is not perfect, for it renders the Auldek unable to bear children, and though they have lived for thousands of years when they come into the narrative, their memories can retain only a normal life's span of time. Long ago their individual histories became nothing but stories they read in books. Their society ends up paralyzed as its people find themselves bound to traditions made all the more important by the fact that they themselves are the protagonists of their heroic legends. By the time they come into the trilogy's story, the Auldek (like so many fantasy characters before them) have grown to despise immortality. They want to achieve once more the martial glory their records say they achieved in their forgotten youth by carving a bloody swath through the Known World, and having done so, they expect to be able to have children again and finally die. This understanding of their motives humanizes them, but it also makes them seem even more implacable, for there's no room for negotiation. Mena's defeat would mean countless deaths of Known World citizens at the hands of the Auldek, but her victory would seem to require exterminating the Auldek to the last man and woman. While some readers may not be convinced that honest slavery is superior to "failed lives" of luxury and power, in the end the deception about the true nature of the regime and its founding puts the trilogy's main characters at a severe disadvantage. Despite leading the most powerful empire, of all the story's factions the Akarans know the least of the truth of the world. They pay a heavy price for their ignorance when they find themselves dealing with the fallout of Tinhardin's actions (the Mein and their curse, the Santoth, and eventually the Lothar Aklun) without ever knowing what those actions were. In fact, the real truth of the matter remains unclear even after the trilogy ends. That Tinhardin was an unsavory person seems likely enough, but it's far from certain that the Santoth, the Mein, and the Lothar Aklun were altogether honest in their accounting of Tinhardin's injustices. In this trilogy, as in real life, the ancient past is ultimately unknowable, and that only makes more indefensible each faction's attempts to redress alleged past injustices with further injustice. The third and final major thread of The Sacred Band takes place in Ushen Brae, the continent that lies across the ocean from the Known World. When the Auldek invasion force departed, most slaves were left behind to their own devices. Now they struggle to organize a government with few traditions to guide them. Complicating matters enormously is the arrival of the League, which does its best to play factions off each other with an aim toward eventually ruling Ushen Brae themselves. How can Dariel Akaran be part of the solution when his family was the cause of the whole problem? The question is often asked of him, and all he can do is protest that he, personally, was kept ignorant of the slave trade and has opposed it since learning the truth. This answer isn't very convincing to the slaves of Ushen Brae, nor should it be. Dariel might not have been directly complicit in the kidnapping and enslaving of children, but throughout his life he benefited enormously from the practice, from the training early in life that put him on the road to leadership to the many advantages he enjoyed after Corinn restores his royal status in the second book. Out of this seeming paradox comes the final answer the trilogy offers to its central question of how to confront injustice: with courage, but also humility. If the Akarans are heirs to an evil tradition, they aren't any more deserving of power than a common person, but that tradition does put them in a unique position to influence other people. Dariel Akaran doesn't become the Rhuin Fà because he's better than the slaves of Ushen Brae, he becomes the Rhuin Fà because he's worse. It turns out that being the Rhuin Fà doesn't mean he can rule the freed slaves and lead a new political order; it means he can offer them some hope that their future won't be as ruinous as their past while they figure out how to rule themselves. A legitimate complaint about The Sacred Band is that having set up these thorny problems, it resolves them a little too neatly and a little too easily. All three of the conflicts outlined above are resolved relatively quickly, for example. This is mostly an artifact of the style Durham has used throughout the series, moving much faster through chronological time than is typically the case. This allowed him to tell an enormously epic story without getting bogged down in an endless series, but this economy of prose deprives the climax of some degree of gravity as fairly important events are relegated to summary. More troubling is the fact that all three conflicts end through the use of at least somewhat novel wrinkles in the story's magic system. These innovations seem reasonable outgrowths of what has gone before, but again some impact is lost by the lack of precedent. These remain quibbles, however, and don't rise to the level of marring a strong climax to a very strong series because these neat magical solutions only address the immediate conflicts; they don't change the fundamental injustices of the world. This task is left for the human characters, and here there are no easy shortcuts, no pat "happily ever after." The world's problems may not be solved, but the Acacia series shows us it is a victory just to confront those problems rather than shrinking back in despair at their size. The final political settlement at the end of the story is clearly not even remotely final, but it's a step in the right direction that carries with it hope that the sacrifices made might purchase a slightly better world for the next generation. It may not be possible to fix the world in a day, or even a lifetime, but that doesn't mean we shouldn't begin.